I often find myself looking at reviews of foundations in hope for it to be the perfect one for me. This double when I was planning what makeup to wear for my graduation; this was also when I dug out this beauty from Bourjois and realised i'd already found my perfect foundation. It's safe to say Bourjois are one of my favourite brands when it comes to base products. I loved the original healthy mix and I was a bit skeptical when it got replaced. However I think I might have to say I prefer the radiance reveal formula. I've been using this on and off for about a year and I love everything about it. Good, medium coverage, adds a lovely natural glow to the skin, doesn't feel heavy or cakey, stays in place and doesn't cling to dry patches. I do powder with this but I find it doesn't go patchy when it starts to wear down on the end of the day. Shade 52 is a great match for me during the Summer but can be a touch dark in Winter so i'm tempted to pick up shade 51. I think that's a good sign that you lovely a foundation when you want to have it in more than one shade! I normally don't wear foundation on a everyday basis, however i've been enjoying sheering this out; which you can easily do, and it hasn't made my skin feel congested. I'm normally not one to review a product twice (original review here), but I just felt like I had to share some love on the amazing foundation as i've been wearing it a lot lately and I can safely say it is my favourite foundation. 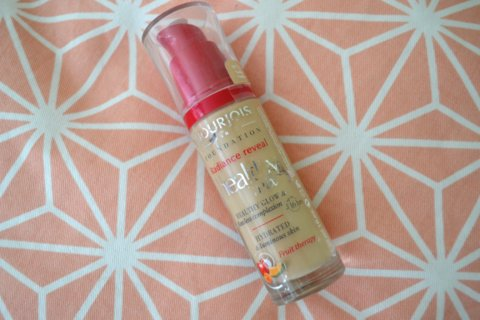 Bourjois Radiance Reveal Healthy Mix Foundation retails for £9.99. This foundation is a goodun! I also have Bourjois 123 foundation and it's also a dream to use. Bourjois have really upped their game this past year or so - I can't wait to see what they bring out next!